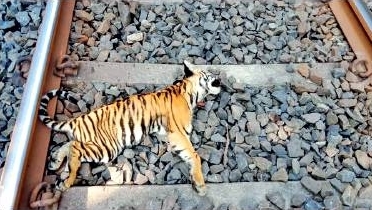 Three six-month -old tiger cubs were killed by a train on the Chanda Fort-Gondia railway section in Maharashtra on a track that has seen an increasing number of animal deaths over the last five years. The incident took place 15 km from Chandrapur in the Chichpalli forest range. The bodies of two cubs were found on the railway track in the morning, while the third was recovered around 500 m away in the forest later. The cubs were run over by a passenger train between Chanda Fort and Keljhar stations. Sources said a tigress with three cubs was often spotted in a nullah near the accident spot. The cubs were following their mother and crossing the track when they were crushed by the train, the train driver told his officers, who informed the forest authorities. Forest officials found a severed paw on the track, but both carcasses had all four paws intact. They began a hunt for the injured cub, and found the body at 4 pm. Forest officers suspect that the tigress dragged the cub away from tracks but left after it died. Chief conservator of forests (Chandrapur territorial) Rishikesh Ranjan said the bodies of a male and a female cub were found on the railway track, but the gender of the third cub found in the forest could not be confirmed as its hind portion was crushed. Earlier, only one passenger train ran on the Chanda Fort-Gondia track. After electrification, many express trains use it. Despite notices from the forest department, railways have not taken measures to cut train speed in the forest.